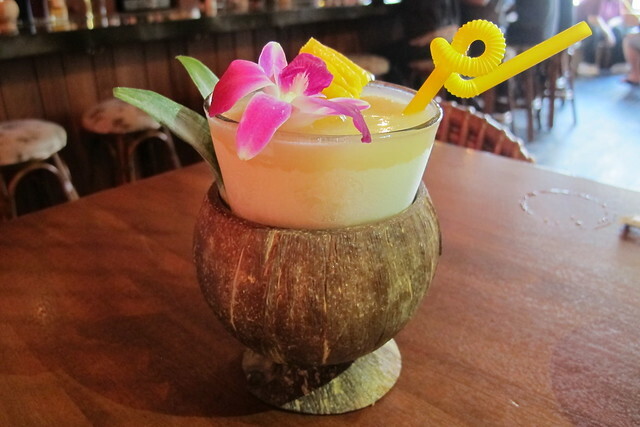 After creating the smash-hit Chicago tiki bar Three Dots and a Dash with Lettuce Entertain You Enterprises, mixologist Paul McGee parted ways with the company in late 2014 and joined Land and Sea Dept. (Longman & Eagle, etc.). 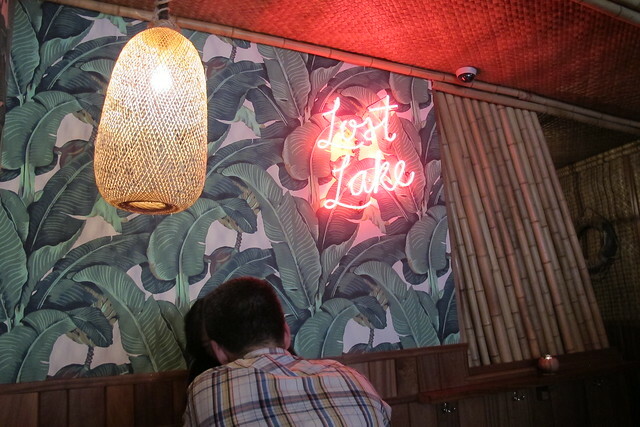 Fortunately, his next project was another tiki bar, Lost Lake, which opened in Chicago’s Logan Square neighborhood in January 2015. Also involved in the venture is Martin Cate of Smuggler’s Cove in San Francisco. He put together a rum tasting club, The Avondale Maritime Academy, that’s starting soon. 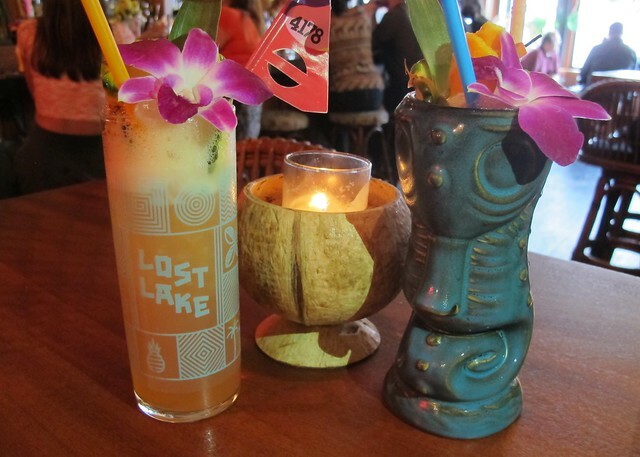 Back when McGee hosted “Tiki Nights” at The Whistler in Logan Square, a friend dubbed one of his drinks “Lost Lake” after an Oregon lake that disappears down a lava tube. 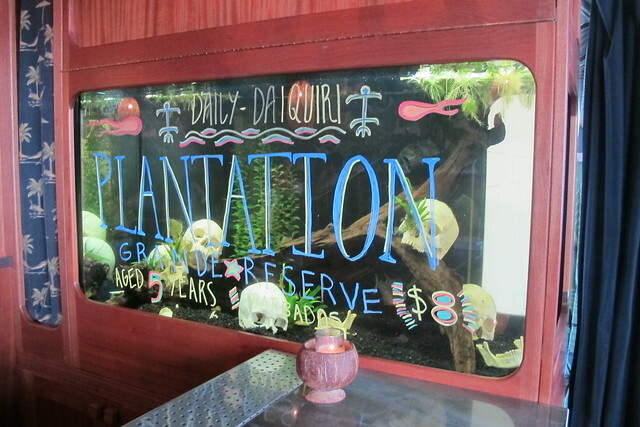 He thought it would make a good name for a tiki bar (and could also allude to Chicago’s own body of water). As you can see in the first picture, the outside is pretty nondescript (kind of like Smuggler’s Cove, as a matter of fact). 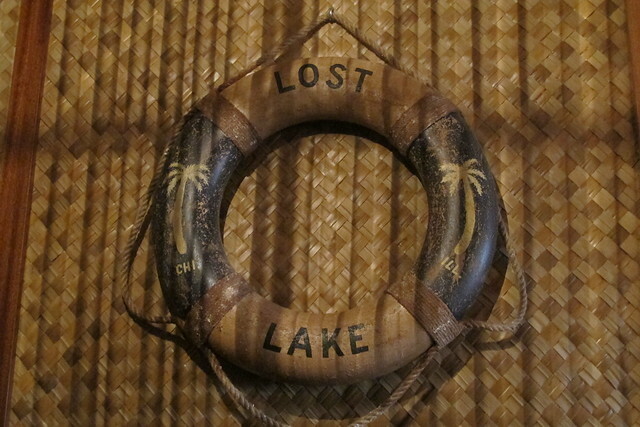 There’s no “Lost Lake” signage, so keep an eye out for the banana leaf print awning and “tiki” spelled out in pink neon letters. The entrance is actually next door through sister establishment Thank You Takeout. 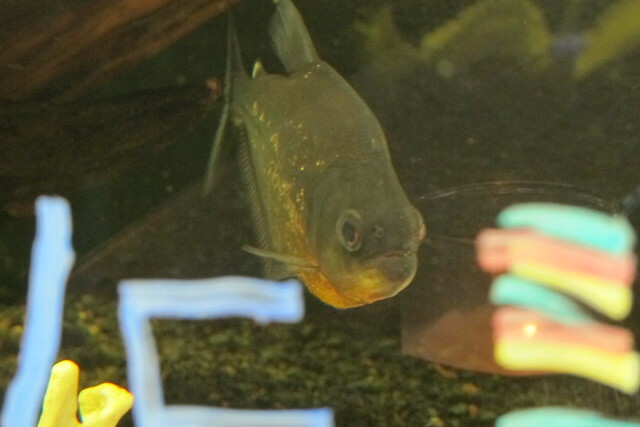 This little fellow is called “Monster” and for the moment he seems to have an uneasy truce with “Rambo,” who apparently scarfed down on his other original tankmates. 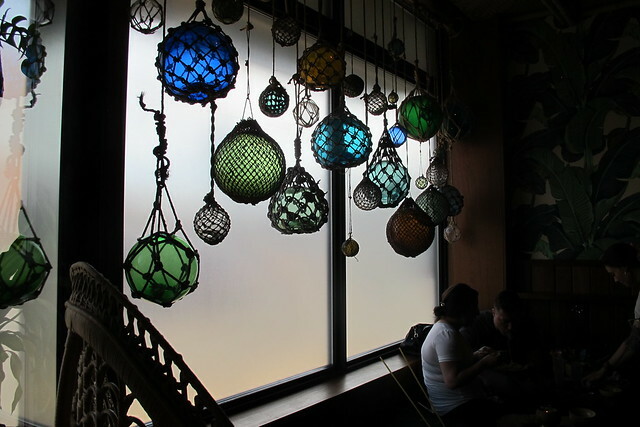 Fish traps outfitted with light bulbs are strung in a line above the bar and the ceiling is covered with lauhala matting and bamboo. 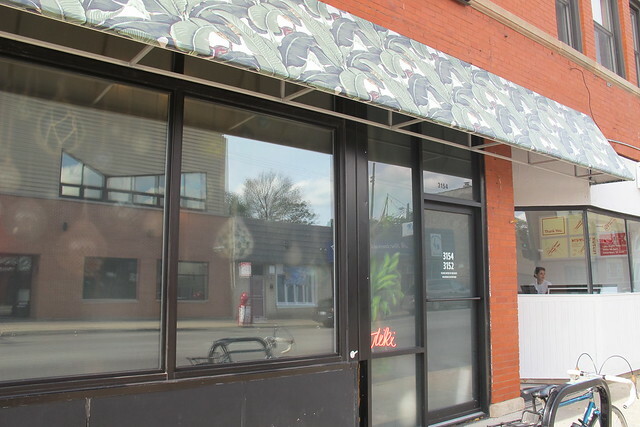 The banana leaf print wallpaper (same as outside) adds some vintage-style flair. Right when you walk in there’s a seating area with a couple peacock chairs next to the frosted window decorated with netted glass fishing floats. 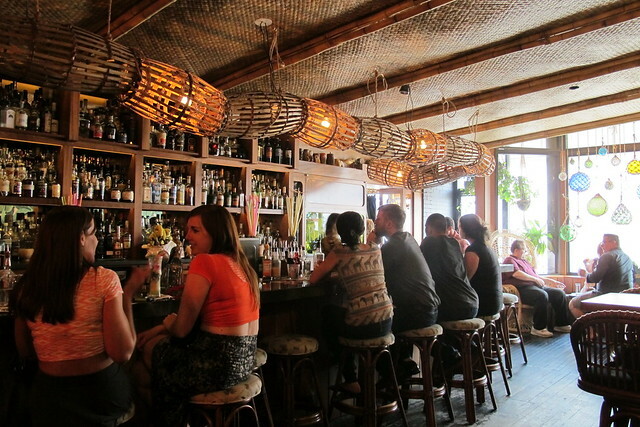 There are more than a dozen rattan stools at the bar plus four tall four-top tables along the wall. Continuing around the corner, there are two booths that allow a bit more privacy. They’re opposite the busy service bar, which is capped off with a thatched roof. Sunlight doesn’t reach this part of the bar so there’s a moodier vibe courtesy of the glowing fish floats above. 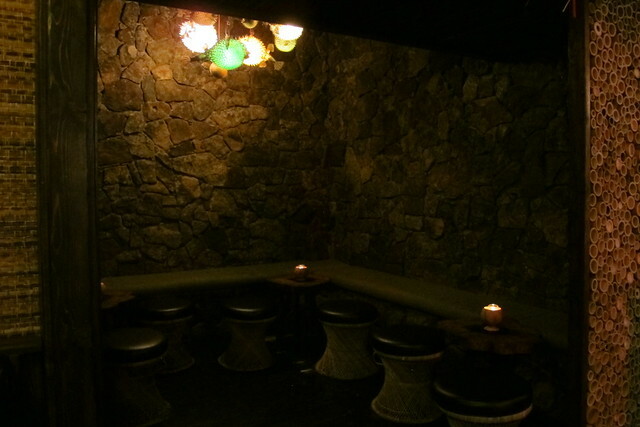 Keep going and you’ll discover “The Grotto,” a neat cave-like nook with a rock wall and a gorgeous chandelier of colorful pufferfish lamps. The décor draws inspiration from the bamboo/beachcomber aesthetics of Polynesian-inspired establishments from the 1930s, before tiki carvings really started showing up in these kinds of spots. 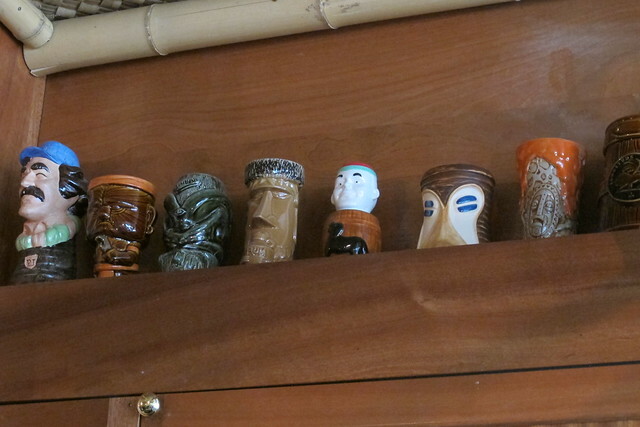 So, the only tikis you’ll find here are in ceramic form — a few Smuggler’s Cove Sunken Tiki mugs on the bar and a shelf above with mugs representing Longitude in Oakland, Trader Sam’s at Disneyland and more. There’s also a display case by the door with more fun stuff like the mask-shaped Tiki-Ti ashtray and a bottle of Lemon Hart rum. The cocktail menu presents a dozen drinks — mostly original creations priced at $12 each — plus four more for sharing ($25 serves 2-3, $45 serves 3-4). Poipu Beach Boogie Board and Bunny’s Banana Daiquiri from Three Dots and a Dash make encore appearances here. The Tic Tac Taxi is a delightful frozen concoction composed of aged multi-island rum, overproof Jamaican rum, house-made coconut liqueur, passionfruit and lime. I tend to like drinks that are on the sweeter side so this was a favorite. I would also highly recommend the lovely and delicate Mystery Gardenia, based on a 1963 drink from Don the Beachcomber in Las Vegas. 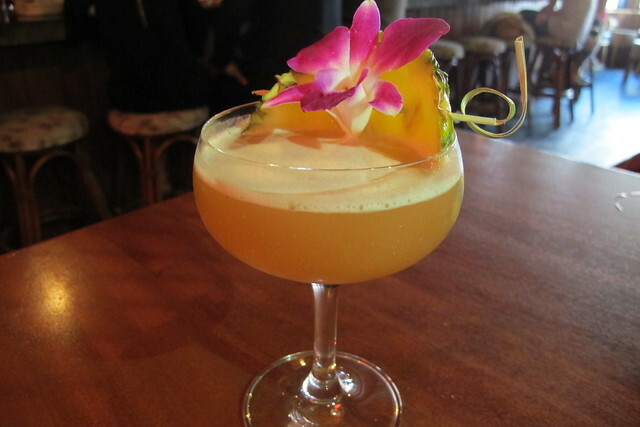 The twist is that the house-made Gardenia Mix (butter, honey and spices) is used to fat-wash the light Guyana rum, which is then shaken with lime and Angostura bitters. 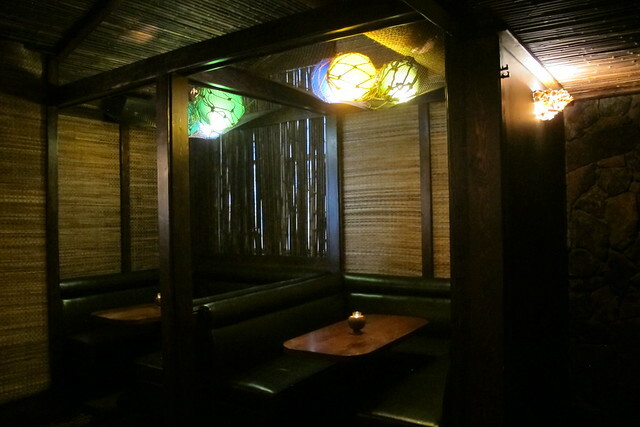 Chinese food and tiki bars have been associated almost from the start. According to Jeff Berry’s book Sippin’ Safari, when Ernest Raymond Beaumont Gantt (aka Don the Beachcomber) first opened Don’s Beachcomber Cafe in 1933, he had to serve food to be eligible for a liquor license. The Chinese chef he hired had to cook out of a wok propped up on a crate because there wasn’t enough room for a kitchen. Thus, it was very fitting for Land and Sea Dept. to set up a Chinese takeout counter, Thank You, in the adjacent space. Hungry patrons at Lost Lake can order from the short menu, which is also available for takeout and delivery. We overdid it for just two people. 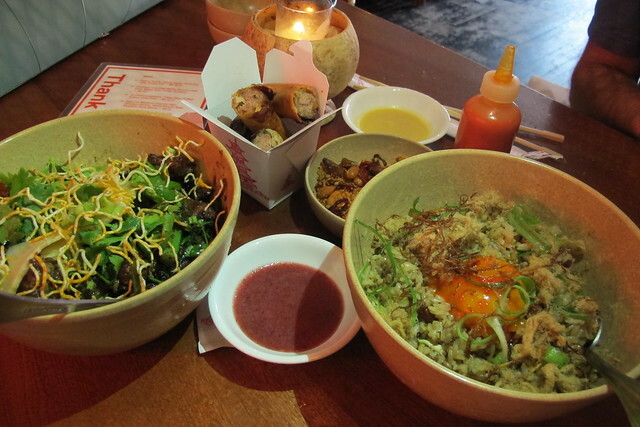 Next time I’d forgo the egg rolls ($5) and Mongolian beef ($10) and just get the addictive peanut snack mix with whole cloves of garlic and bird’s eye chili ($3) and the fried rice with Chinese sausage and an egg yolk on top ($10). Lost Lake is open every day from 4 p.m.-2 a.m. (3 a.m. on Saturdays). There are a few daily specials, including an $8 daiquiri and $7 Tiny and a Tot (a pony glass of Lost Lake Exotica Ale with a shot of rum). McGee collaborated with Marz Brewing on this Maibock-style beer with fruit flavors intended to complement rum. Yet another reason you’ll want to wash ashore at Lost Lake. Thanks for a great review and photos! I plan to visit Lost Lake when I come to Chicago later this month. Did they sell any collectible merch? A new place to visit when I go home this summer!